Place the stock, garlic cloves and sprigs of thyme in the bottom of a 6 quart Instant Pot. Place the trivet on top and the cauliflower on the trivet. Cook for 15 minutes on the steam setting. Do a quick pressure release (release the pressure immediately when the IP beeps). Allow the cauliflower to rest with the lid open for 10 or so minutes, until it cools slightly and it safer to handle (and allows extra moisture to drip off). Carefully transfer the cauliflower to a new pot with as little liquid as possible from the Instant Pot. 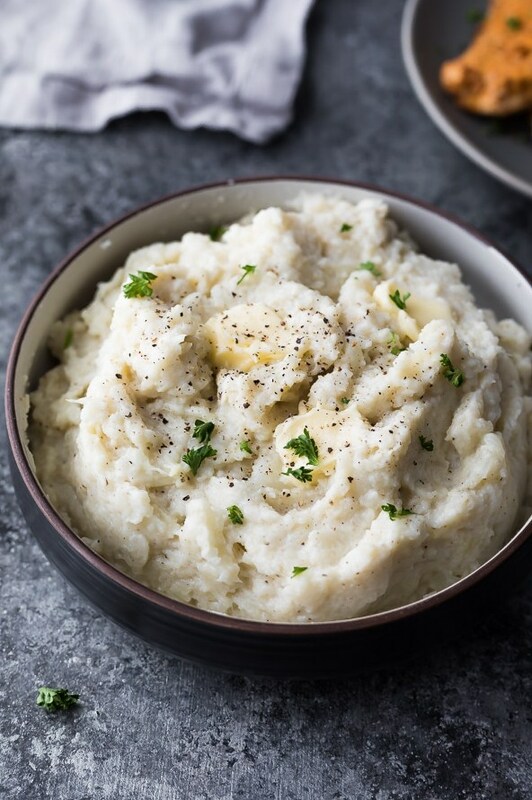 Mash with the yogurt, cheese, salt and pepper. This recipe is easy to re-heat in a pot or the microwave, and keeps in the fridge for 3-4 days.